The history of Yamaha can be traced back to 1861, when Torakusu Yamaha began his apprenticeship as a clockmaker. He then set up business in Hamamatsu, repairing and manufacturing reed organs. His business prospered, becoming Nippon Gakki ("Japanese Musical Instruments") in the 1890s, and added pianos to its range in 1899. When Japan invaded China in 1931, it needed a manufacturer capable of making variablepitch airscrews for its warplanes. With its experience in woodworking and precision engineering, Yamaha was a natural choice. This was the start of the company's diversion into other fields. In the 1950s, Yamaha decided to try its luck among the hundred or so companies vying to conquer the Japanese motorcycle market. Like so many other manufacturers around the world, Yamaha took the excellent DKW RT 125 as its model. speeds instead of three. Production began at the rate of 300 units a month. The Acatombo was a huge success, and some 11,000 were built during its three-year production span. From the beginning of motorcycle manufacturing in 1955, Yamaha considered racing as the best form of publicity. Modified Acatombos dominated the first race held on the cinder track around the volcano at Mount Asama, 75 miles north of Tokyo. 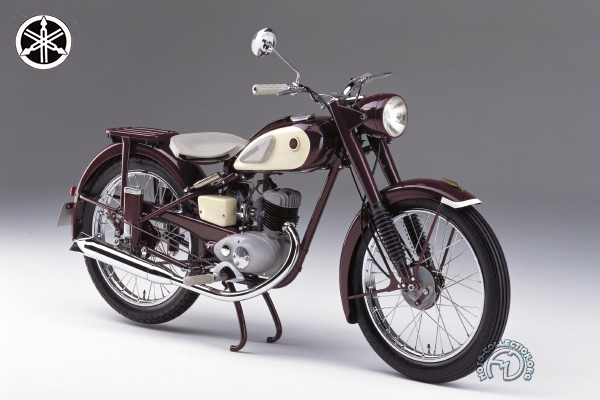 The original Yamaha made a brilliant debut, winning the first Mount Asama hill climb. This version, transformed into a motocross machine, dates from 1957.